The Illinois Streamflow Gaging Network has been operated by the U.S. Geological Survey (USGS) since the early 1900s. From its inception, the operation of the network has been maintained through a cooperative partnership between the USGS and state and federal agencies. Hydrologic information provided by the network is vital for the general management of Illinois' water resources. Streamflow data are continually used for forecasting floods and droughts; assessing the biological and chemical health of our streams; operating reservoirs, water supply facilities, wastewater treatment facilities, and hydroelectric plants; assessing and predicting the long-term impacts of climate and land-use trends on our streams; and numerous other important uses. The purpose of this study was to conduct a comprehensive evaluation of the use of Illinois streamflow data, with the goal that this information and analysis will be used by the network's cooperating agencies and others for current and future decisions related to funding and content of the network. Evaluations such as this have been conducted in the past, and should continue to be conducted periodically to assess whether the network meets the data needs of users in an effective manner, to assess emerging needs, and to anticipate needed programmatic changes to the network. This report identifies several emerging applications for which more and additional types of stream data likely will be needed, including applications related to stream and watershed restoration and water quality load assessment. However, in general, it is not possible to anticipate many of the future needs of the streamflow gaging program. More often than not, emerging issues will need to use streamflow data far before there is sufficient time to collect data for that specific use. 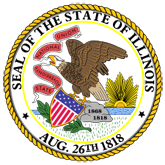 The only way to have adequate data when these needs arise is to maintain a base network at locations that are representative of the streams of Illinois, such that these long-term data are available to meet a broad range of potential needs. This base network of gaging stations also is needed to provide general streamflow information for ungaged streams throughout Illinois. There are thousands of streams in Illinois, whereas the network currently includes roughly 160 continuous-streamflow gages on fewer than 110 of these streams. For other streams, flow characteristics must be estimated from the available gaging records using regional hydrologic principles. Various methods are available to evaluate the effectiveness of specific gaging records for use in this regional transfer of information. This report includes several descriptive measures of the regional value of gage information and also summarizes a numerical evaluation based on information transfer theory. No single approach can effectively describe the broad range of considerations needed to evaluate the regional value of gages. However, it is clear that applications in regional hydrology will need additional data beyond those which are currently supported by the network. Specifically, the base network is noticeably lacking data from small watersheds in rural Illinois. In addition, several hydrologic regions in Illinois have a limited number of gages for use in regional analysis. Two questionnaires were developed to ascertain the importance and uses of the data from the streamflow gaging network. The first questionnaire was distributed to all agencies that provide cooperative funding to the network. The second questionnaire was developed on an Internet Web site to be accessed and filled out by all interested users of Illinois streamflow data. In both questionnaires, the respondents were asked to identify: 1) the types of data that they most frequently use and/or are most critical for their needs; 2) categories of data applications and their relative importance; and 3) the importance of specific gages for their applications. The report provides a ranking of the relative importance of individual gages based on the responses from the questionnaires. The users indicate that river forecasting/flood warning is the overall most important category of application of streamflow data, followed by long-term flow statistics for analyzing hydrologic trends and determining human impacts to streams. However, the majority of users are more likely to use streamflow data for individual project needs such as those related to hydrologic-hydraulic modeling and design, and biological and conservation assessment. Analysis of gaging records indicates that streamflow conditions are not stationary, and vary not only from year to year but also from decade to decade as influenced by climate variability and other factors. More than half of the long-term flow records in rural areas show statistically significant increases in average and low-flow conditions that appear to occur as a result of climate variability. Statewide, over the past 25 years, there has also been an average increase of 18 percent in the estimates of the 100-year flood peak discharge as represented by long-term records. With the decline in the number of crest-stage peak-flow gages and small watershed gages, many of the records available for certain types of hydrologic analysis are older, discontinued gaging records that may not accurately represent the expected present-day, long-term hydrologic conditions. Shorter gaging records, regardless of period of record, also may not fully represent the expected long-term conditions. There is a need for analytical techniques to assess inherent differences in streamflow records and characteristics such as flood frequency that are caused by climatic variability and other factors. The network appears to be meeting most traditional current-use needs. However, there is a need to reinforce the base network, specifically regarding data for relatively small rural watersheds that are needed to address various emerging issues, long-term regional assessment, and peak flood estimation. The size of the overall network would have to be increased an additional 15-20 percent to more effectively address data needs related to small to medium-sized rural watersheds. Also, there is a growing need for new types of stream data to address specific biological and conservation issues such as stream and watershed restoration. This report only addresses streamgaging issues related to flow quantity, and thus there are no conclusions or recommendations related to water quality, precipitation, or other types of hydrologic data. Funding for the Illinois Streamflow Gaging Network is subject to uncertainties, and this is especially the case regarding potential growth or changes to the network. The National Streamflow Information Program (NSIP), initiated by the USGS in 1999, proposed that the USGS eventually would assume the costs of gages that directly meet specific federal interests. However, it is uncertain whether this or other initiatives from traditional funding sources will produce a prominent change in the size and character of the network. More likely, gaging needs for emerging issues will need to be funded from new sources currently not participating in the network. By its nature, it is essential that the base network be funded mainly through state or federal agencies with a long-term commitment to the streamflow gaging program. 1. Evaluation of the Illinois Streamflow Gaging Network (20061003183713_ISWSCR2003-05.pdf).